Having heard of the Foundation’s work through the Diocese of Allentown and the Mid-Atlantic Catholic Schools Consortium, the Archdiocese became a funding partner supporting implementation of the Healey Advancement Methodology in six elementary schools beginning in 2015. The Archdiocese plans for this phase to serve as a model and training ground for its nearly 50 Catholic elementary and middle schools. The six schools have initiated a move to early re-registration in their first full year of engagement with Healey. Nearly 80% of current families re-registered prior to Catholic Schools Week. Launched in 2011 via a partnership with Connelly Foundation, Phase 1 resulted in $1.3 million in revenue increase from enrollment growth and development across five elementary schools. By year two in their Annual Funds, the schools had raised a combined $380K and achieved a 101% increase in donors over the prior year. In Phase 2, six merged elementary schools, supported through the Archdiocese and the Sullivan Fund, increased enrollment by a combined 5% in 2015-16 over the prior year. The schools brought in 85 new students and $255K in revenue through tuition transfer grants. In 2015-16, through a partnership with Faith in the Future, the Healey Education Foundation began work with four high schools in the Archdiocese. The Foundation is beginning work with elementary schools in the Archdiocese for implementation in 2016-17. These efforts are made possible through grants from GHR Foundation and the Catholic Schools Center of Excellence, which is supported by GHR as well as Schulze Family Foundation, the Catholic Community Foundation and the Aim Higher Foundation. Following a phased approach beginning in 2012, Healey is now working with 19 schools in the Diocese, eight of them alumni schools. In Phase 1, which completed the three-year implementation for six schools in 2015, the schools achieved a combined net impact of over $1.3 million in revenue from enrollment and annual fund dollars. Among high schools are those that have experienced their first enrollment growth in 10 years and have surpassed the combined enrollment of merging schools. Several have secured six figure Annual Fund gifts. Among elementary schools are those that have experienced their largest enrollment growth in more than 15 years. All have raised more than $25K in their first year Annual Funds and have established Boards of Specified Jurisdiction. The Foundation’s work in Catholic school sustainability began in Camden, NJ. In 2007-08, the Diocese had recognized the need for a major consolidation of its elementary schools. After the decision to consolidate, the Foundation conducted extensive research and ultimately offered a new advancement approach to usher in the cultural shift and share the best practices required for long-term success. Today 13 Diocesan schools are Healey alumni, including recent Founder’s Award recipient Saint Mary School (Vineland, NJ). Healey also co-founded and helped fund the Catholic Partnership Schools. A nationally-recognized, replicable model of high performing Catholic elementary schools, the Partnership serves more than 1,000 children in five culturally-distinct neighborhood schools in Camden. MAIN STORY PHOTO: Robert T. Healey Sr., Founder, Healey Education Foundation, being welcomed to the podium by SAGE attendees. At far right, Rev. 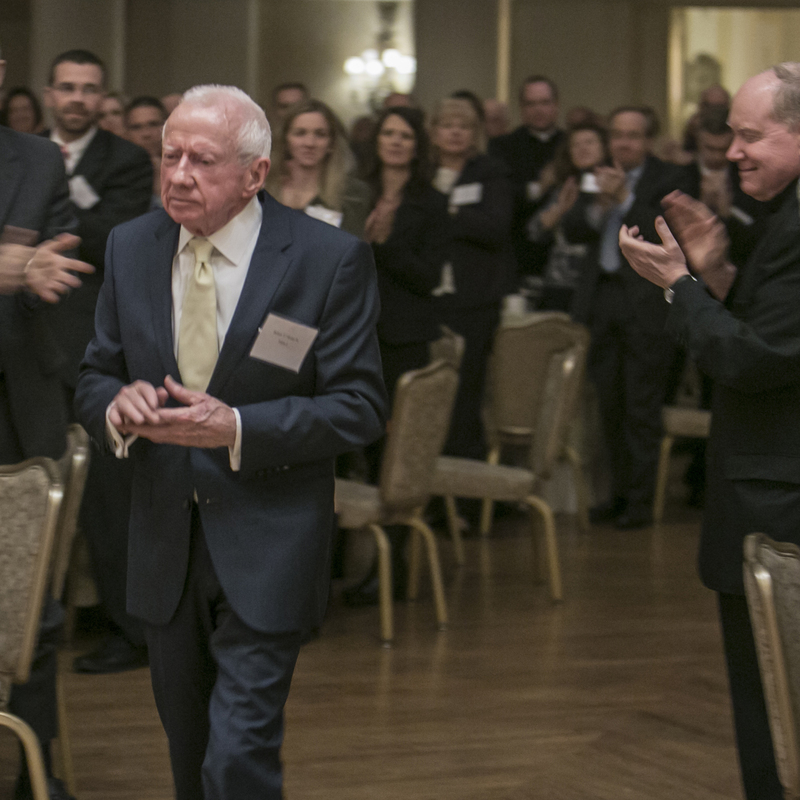 Timothy R. Scully, CSC, co-founder of Notre Dame’s Alliance for Catholic Education (ACE) and Hackett Family Director of the Institute for Educational Initiatives (IEI), who also spoke at the event.